Could this be the End of Peace in Zambia? government will look so weak that the opposition expect to reap huge rewards of political power once the dust settles? There is a possibility that arsonists have set all the terrible fires. My limited knowledge of minds of arsonists from police crime documentaries is that arsonists all gain tremendous rash of physical gratification from the site of huge burning fires they have caused; the bigger the fires the better for them. Since everyone pays so much attention through word of mouth, news outlets, photos, and videos of the huge sight of the fire and the destruction it causes, there are some people who will imitate the terrible actions by setting new fires themselves; these are the copy cats. Those with criminal minds like to take advantage of such chaotic situations. The fires and the vandalism could be the actions of criminals. I am sure Zambia’s security forces have probably already investigated these possible motivations for these criminal actions that endanger public security. I am sure that from the President, security forces, and ordinary citizens all over Zambia, people have an idea whether this is political sabotage or not. 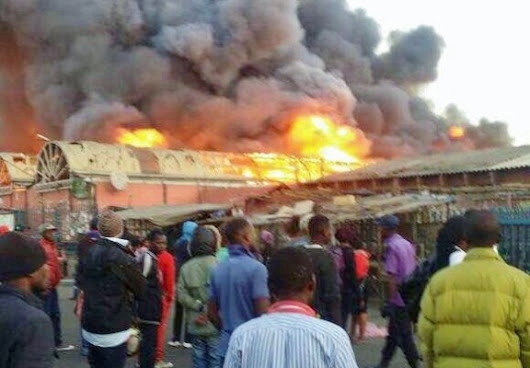 Because all the terrible incidents have happened among ordinary Zambians, those destructive people who carry out these terrible actions of arson and vandalism live, talk, go home, sleep and walk among Zambians. Some Zambians have to know who is doing this and why. I will not suggest any suspects as my aim is for everyone who is reading this to think in a wider picture about 14 million Zambians as opposed to narrow political motives. Assuming that this is political sabotage, if the aim of members of disgruntled opposition political parties is to cause so much fear and chaos that the country becomes ungovernable, how can you be sure that once the chaos perhaps stops, you will assume political power if we have elections at all? If everything is in flames in Zambia how will you rule? If you as the opposition now somehow assume power later because the country has become ungovernable through your terrible actions, what will stop the next opposition parties from using the same strategy of planting chaos in order to later win power? The cycle of destruction would never stop. Are these the kind of politics we want in Zambia? The Biblical story is that two women had a serious dispute because each claimed to be the mother of the newly born baby. The case was brought before King Solomon. In order to solve the case, King Solomon ordered one of his guards to bring a huge sharp sword. The baby was laid on a pedestal. The King told the 2 women that he would order his guard to cut the baby in two so that each woman would have half of the baby. The first woman cheered and said the King’s decision was very wise. The second woman cried and between sorbs said she rather the King gave the baby to the first woman even though the second woman knew she herself was the real mother. When the King asked her why she gave up the fight, the second women replied she would rather the baby stay alive and live with the other woman. The King handed down his judgment and gave the baby to the second woman who the King believed was real mother because she did not want her baby to be killed and preferred the other woman to raise it. At least the baby would be alive. The moral of the story is that all politicians in Zambia should follow the biblical King Solomon story. If you love your country, you do not want to create chaos, violence, and threaten or act in any way to destroy the country so that you can rule it. You should have enough love of the country and confidence that other elected Zambians can lead the country peacefully. You should be able to find peaceful means of resolving all political disputes. I will never forget being among now fewer Zambians who have lived through all the 53 years of peace since Zambia’s independence in 1964. Creating a nation of peace and tranquility is not easy. There are always challenges, serious ups and downs. We used to think President Kaunda was a madman whose public speeches during his 27 years always repeatedly urged Zambians to love one another; to avoid tribalism, racism, hate, and to fight ignorance, disease, and exploitation of man by man. In one of his hundreds of speeches during the 27 years, President Kaunda once warned potential political saboteurs who were said at the time to be meeting and plotting in dark corners, that once the whole country was engulfed in flames, there would be neither peace nor a place for the political saboteurs themselves and even criminals to enjoy their spoils. My advice to any Zambians who will listen is that as a Zambian never ever take the peace for granted. Because once it is lost, sometimes it may never come back. Every Zambian has to guard the peace jealously. It means that if you are a young cadre in any political party and a fellow Zambian is urging you to engage in violent criminal acts, such as arson and destroying ZESCO pylons especially for political motives, you have to oppose him or her. Everyone has to work with other citizens to find peaceful ways of achieving change if you strongly feel Zambia is becoming undemocratic. Does God Exist? Where Do We Come From? ; Astrophysics for people in a Hurry: Book Review Why Do We Love Animals?